Perform "Inspection After Repairs" after replacing the engine assembly, cylinder head sub-assembly, camshaft, No. 2 camshaft, No. 3 camshaft sub-assembly, No. 4 camshaft sub-assembly, camshaft timing gear assembly, camshaft timing exhaust gear assembly, piston sub-assembly or piston ring. 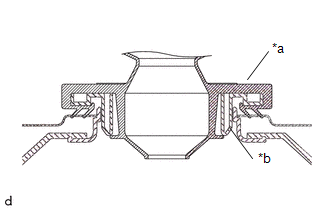 (a) Attach an engine sling device and hang the engine assembly with a chain block. 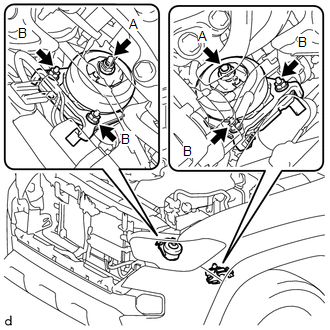 Pay attention to the angle of the engine sling device as the engine assembly or engine hangers may be damaged or deformed if the angle is incorrect. (b) Lift the engine assembly and remove it from the engine stand. (c) Place the engine assembly onto a work bench. Perform "Inspection After Repairs" after replacing the engine assembly. (b) Slowly lower the engine assembly into the engine assembly compartment. (c) Install the front engine mounting insulator LH with the 3 nuts and 2 bolts. (d) Install the front engine mounting insulator RH with the 3 nuts and 2 bolts. (e) Remove the 4 bolts, No. 1 engine hanger and No. 2 engine hanger. (b) Install the crank angle sensor plate, drive plate and ring gear sub-assembly and rear drive plate spacer to the crankshaft. 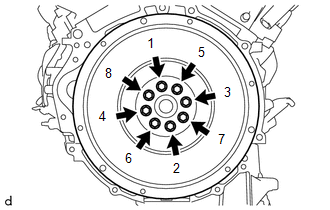 As the crank angle sensor plate, drive plate and ring gear sub-assembly and rear drive plate spacer are not reversible, be sure to install it in the direction shown in the illustration. (c) Clean the bolts and bolt holes. 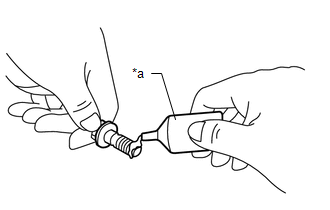 (d) Apply adhesive to 2 or 3 threads at the end of the 8 bolts. 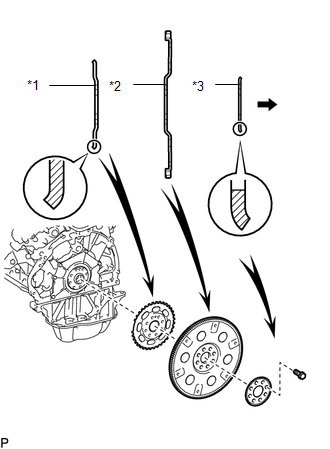 (e) Uniformly install and tighten the 8 bolts in several steps in the sequence shown in the illustration. Do not start the engine for at least an hour after installing the drive plate. (b) Install the crank angle sensor plate and flywheel sub-assembly to the crankshaft. (f) Mark paint marks on the bolt heads on the engine upper side. 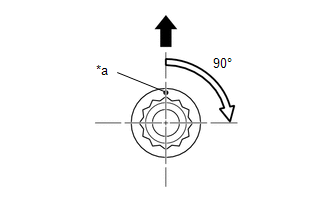 (g) Tighten the bolts 90° in the sequence shown in the illustration. 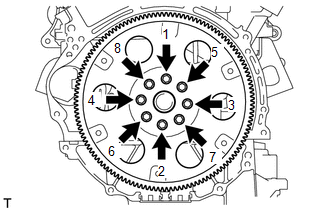 Do not start the engine for at least an hour after installing the flywheel sub-assembly. (a) Connect the suction hose sub-assembly with the bolt. (b) Attach the clamp to connect the wire harness to the suction hose sub-assembly. (c) Connect the engine oil pressure switch assembly connector. (a) Connect the No. 1 fuel tube sub-assembly to the fuel delivery pipe sub-assembly. (a) Connect the water hose sub-assembly. 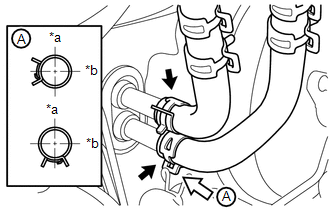 The direction of the hose clip is indicated in the illustration. (a) Attach the grommet to the wire harness support. (b) Pass the wire harness into the vehicle and install the wire harness support. (c) Connect the 7 ECM connectors. (d) Attach the clamp to connect the engine wire. (e) Install the instrument lower panel assembly. (f) Attach the claw to connect the engine wire. (g) Attach the claw to connect the engine wire to the engine room relay block. (i) Connect the engine wire connector. (j) Attach the clamp to connect the engine wire. 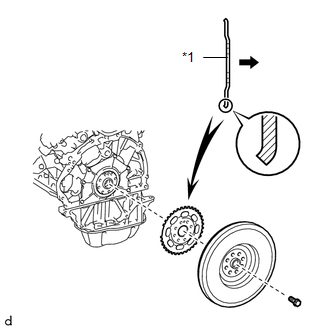 (a) Install the vane pump assembly with the 2 bolts. (b) Install the bolt to connect the earth wire harness. Make sure that no oil adheres to the connector. (a) Install the air cleaner case sub-assembly with the 3 bolts. (b) Install the air cleaner filter element sub-assembly. (a) Install the front fender apron upper seal LH with the 5 clips. (a) Install the front fender apron upper seal RH with the 5 clips. (a) Install the hood sub-assembly with the 4 bolts. (b) Connect the washer nozzle hose.